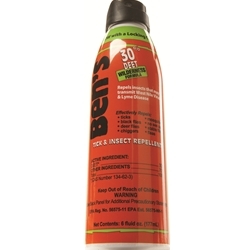 Ben's® 30 Tick & Insect Repellent offers protection from ticks and insects that may carry West Nile Virus (WNV), Lyme disease, Malaria, Eastern Equine Encephalitis (EEE), and other infectious diseases. Providing up to 8 hours of effective protection, Ben's® 30's unique formula is made to evaporate slowly - so repellent stays on longer with little absorption into the skin. 6oz continuous spray bottle provides effortless, even application. Don’t Get Bitten, Get Ben's®! Eco-Spray® can delivers even, continuous spray without releasing harmful aerosols. Adventure Medical Kits President Chris Gubera takes you through the Ben's 30 range of insect repellents, including which product is the right one for your favorite activities. Ben's 30's water-based formula lasts longer, offering protection up to 8 hours.